When you think of 1950s Atomic Age design, a handful of images probably pop into your mind: The Ball Clock. The Marshmallow Sofa. The Sunburst Clock. 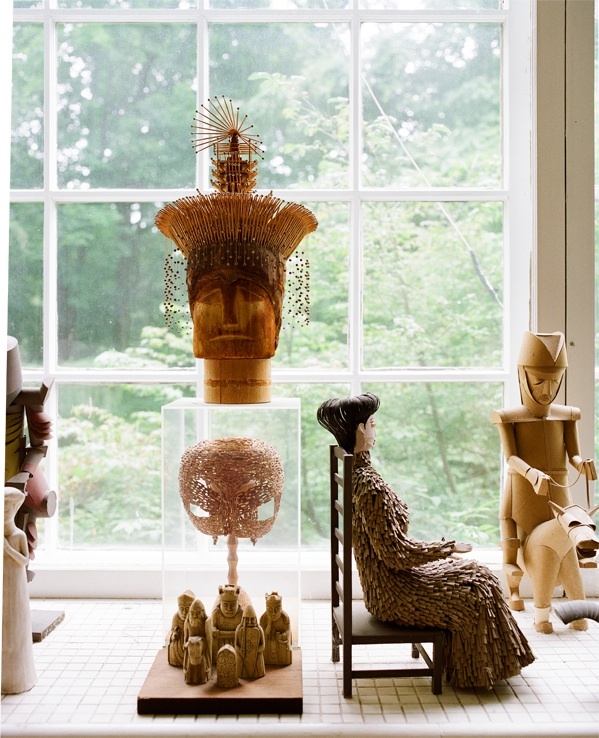 What you probably don’t realize is that the designer of these Mid-Century Modern icons spent decades living in obscurity, filling his upstate New York farmhouse with 300-some whimsical handmade paper sculptures of animals, Pre-Columbian and Southeast Asian figures, Cubist abstractions, and African masks. But in a few weeks, Irving Harper and all of his delightful creations will come into the light, thanks to a new Skira Rizzoli book, Irving Harper Works in Paper, which hits stores February 12, 2013. 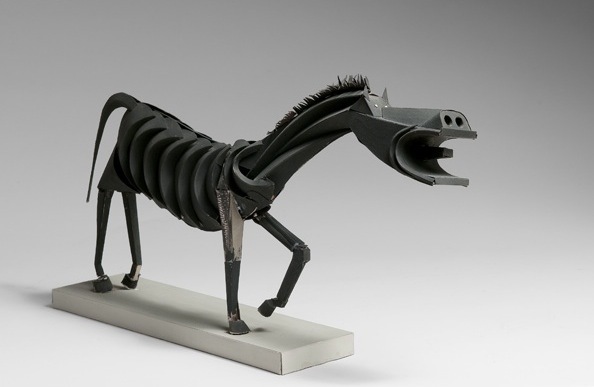 This full-color tour of Harper’s personal sculpture collection is the result of an effort by Michael Maharam—who first visited Harper’s home in 2001—to preserve these unique works of art. 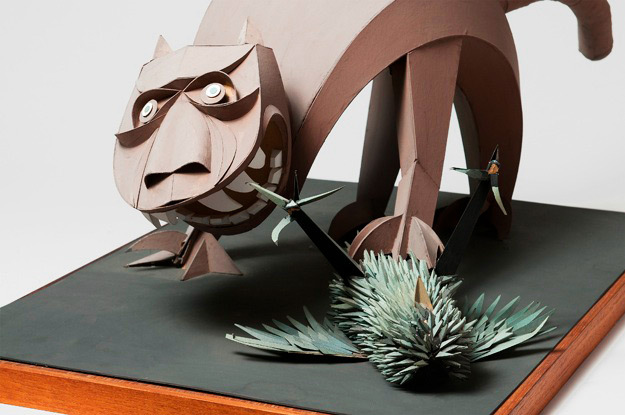 Top: A cat attacks a bird in Irving Harper’s paperboard sculpture. Photo by D. James Dee, from “Irving Harper Works in Paper.” Above: Harper’s 1949 Sunburst Clock is still credited to George Nelson on the site of Swiss furniture company, Vitra, which sells them now. Image via Vitra.com. Harper, who is now 96 years old, worked for the George Nelson Associates design firm between 1947 and 1964, the height of Mid-Century Modern innovation, developing a wide array of products. While there, Harper created the Marshmallow Sofa for Herman Miller furniture, as well as the company’s logo, and the Ball and Sunburst clocks for Howard Miller. These products are still made and sold today—and still largely credited to George Nelson. As the CEO of Maharam, a textile design company, Michael Maharam sought out Harper in early 2001, hoping to reissue a couple of the Herman Miller textile patterns he designed—Pavement and China Shop—for Maharam’s Textiles of the 20th Century line. 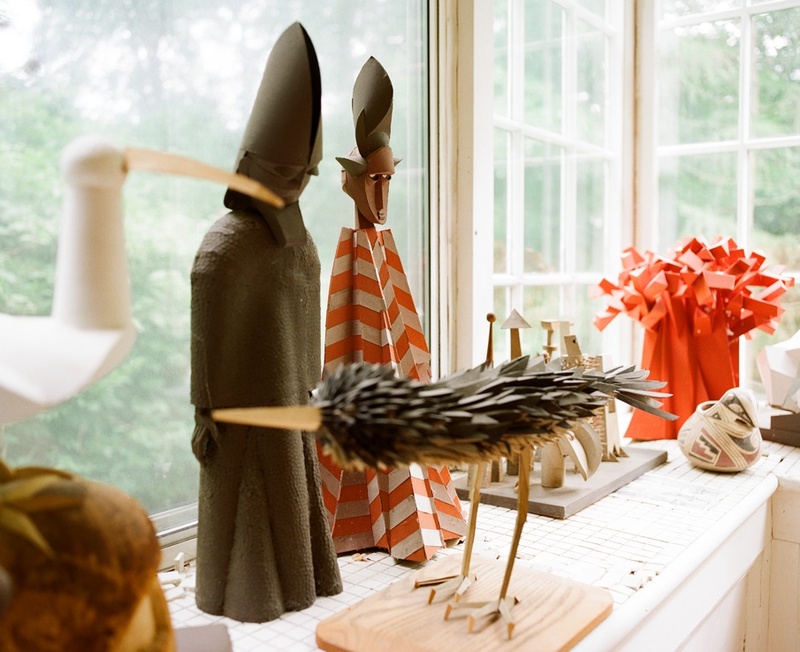 Traveling to Harper’s wooded home in Rye, Westchester County, he discovered a wonderland of paper art, and a quintessential Mid-Century Modern designer feeling slightly defeated by the lack of credit he received for his inventions. Touched, Maharam purchased an iMac for his elderly colleague and showed Harper how to Google himself. Harper, who had never owned on a computer, was floored to see his name come up thousands of times. Maharam also tipped off his friend Paul Makovsky, the editorial director of Metropolis Magazine, about this unsung, living creative force of the 1950s. Makovsky also headed up to Harper’s home in Rye and made his “Being Irving Harper” piece the Metropolis cover story in June 2001. Maharam worked with Irving Harper to reissue two of his 1950 Herman Miller textile prints in 2001, China Shop (left) and Pavement (right), for Maharam’s Textiles of the 20th Century line. Thanks to the Internet, it wasn’t long before the underdog found new champions. Artist and illustrator Matte Stephens was so inspired by the Metropolis article, he decided he had to see Harper’s artwork for himself, and finally made it to Rye in 2007, a trip documented on Design Sponge. In 2010, Guy Trebay was similarly moved to cover Harper’s creations for The New York Times’ T. Magazine. 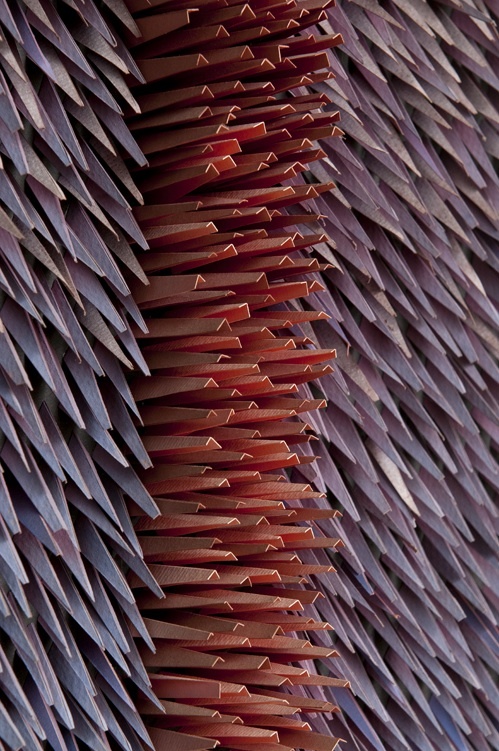 When Maharam checked in on Harper in the wake of his wife’s death in 2009, he noticed that all these beautiful, one-of-a-kind paper sculptures were starting to deteriorate and fade from the sun. So he asked the designer how he’d feel if Maharam and his colleagues restored and photographed his sculpture for a new book. In the 2001 Metropolis article, Harper explained that in the 1950s, the designers creating the bold new look of the future had almost a rock-star status. “They were considered geniuses, individuals responsible for transforming the look of American product,” Harper told Makovsky. “So there always had to be one name associated with the work. Harper wasn’t the only fertile Mid-Century Modern mind working under George Nelson, producing pioneering furniture pieces for Herman Miller. 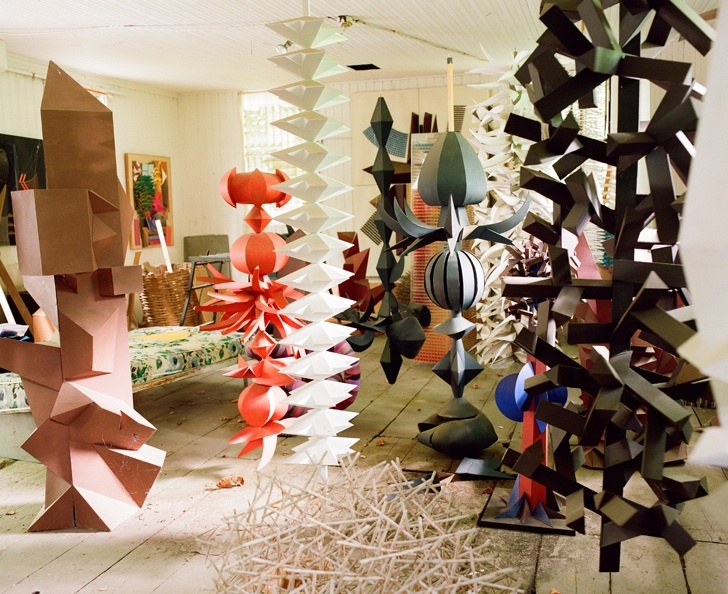 Nelson often hired Mid-Century Modern superstars like Charles and Ray Eames, Isamu Noguchi, and Alexander Girard. Others labored in semi-obscurity: John Pile made the Pretzel Chair, Charles Pollock the Swag Leg Armchair, George Mulhauser the Coconut Chair. Ronald Beckman and John Svezia collaborated on the Sling Chair, while Ernest Farmer designed the Case Goods modular storage. As chief designer, Harper oversaw most of these projects, too. Nelson himself was never a designer. 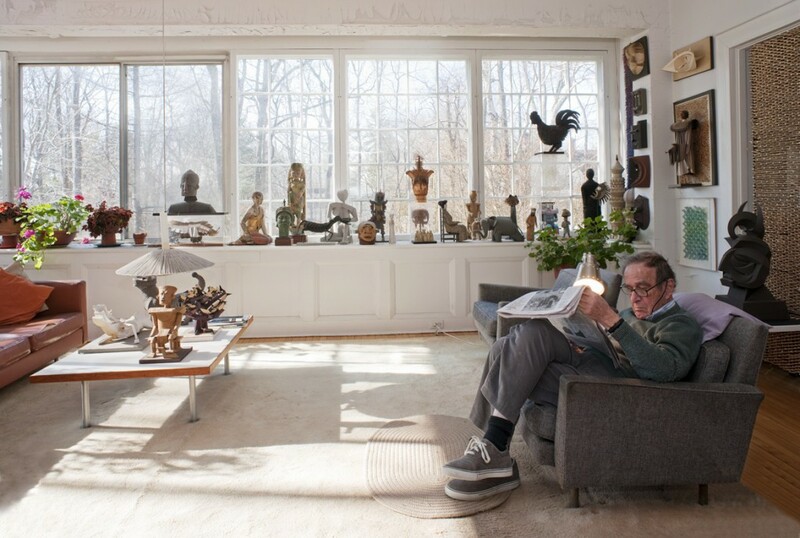 When Julie Lasky, the deputy editor of the New York Times’ Home section, visited Harper, he divulged to her, “I never saw George sit down and design anything.” An architect and brilliant writer, Nelson made a name for himself in the design world because he had an articulate design philosophy, an eye for talent, and the sort of outsize personality to get the media attention and show-stopping gigs a world-class creative firm needed. Harper, on the other hand, was more the quiet sort who prefered to sit at his draft table and make things. Even today, Nelson is celebrated as a founder of American Modernism, who “tore the numbers off clocks,” as he was at a Yale School of Architecture exhibition that closed this month. But for an introverted creative type who didn’t have the impresario personality, working for George Nelson Associates was a pretty sweet deal. “For a good 16 years or so, Irving Harper helped build George Nelson’s reputation, and George Nelson gave a place for him to tinker, have fun, and make money,” Lasky says. In fact, Harper’s interior design career was something of a happy accident. He grew up in New York City, where he studied liberal arts at Brooklyn College after high school. At night, he took classes in architecture at the Cooper Union for the Advancement of Science and Art. Graduating in the middle of the Depression, he found that architecture jobs were scarce. 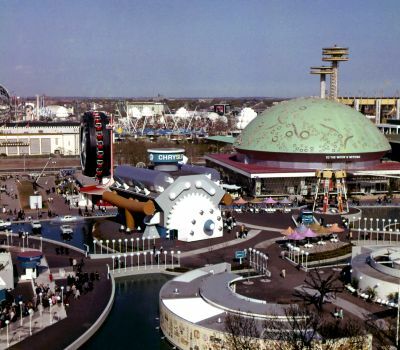 But in 1938, Harper got hired by the Modernist architecture firm of Morris B. Sanders to work on the interiors of the Arkansas Pavilion for the 1939 New York World’s Fair. That’s when he discovered his designer calling, at age 22. Harper quickly moved on to a job with industrial designer Gilbert Rohde, who had helped define the Art Deco Streamline Moderne movement in America and also worked as the design director for Herman Miller furniture from 1932 until his death in 1944. For Rohde, Harper created more 1939 World’s Fair interiors, for the Plexiglas exhibit, the Anthracite exhibit, and the Home Furnishings Focal. In 1940, Harper married lawyer Belle Seligman, who shared his left-wing politics. During World War II, Harper served in both the Army Corps of Engineers and the Navy, and when he returned, he conceptualized department store interiors for industrial designer Raymond Loewy, who eventually devised the 1953 Studebaker. Bored with his work for Loewy, Harper was thrilled to take a job with George Nelson in 1947, who had assumed Rohde’s position at Herman Miller and was also founding his own design firm, George Nelson Associates. Right away, Harper was presented with a challenge: Inventing a new logo for Herman Miller furniture, with no clue as to what the upcoming George Nelson-influenced line would look like. Harper made a large wood-grain patterned M using a swooping French curve, a brand image the company still employs 66 years later. The first time Irving Harper’s wood-grain M logo for Herman Miller appeared was in this 1947 ad. From “Irving Harper Works in Paper,” courtesy of the Herman Miller Archive. But perhaps the object that sparked Harper’s wild imagination most was the clock. 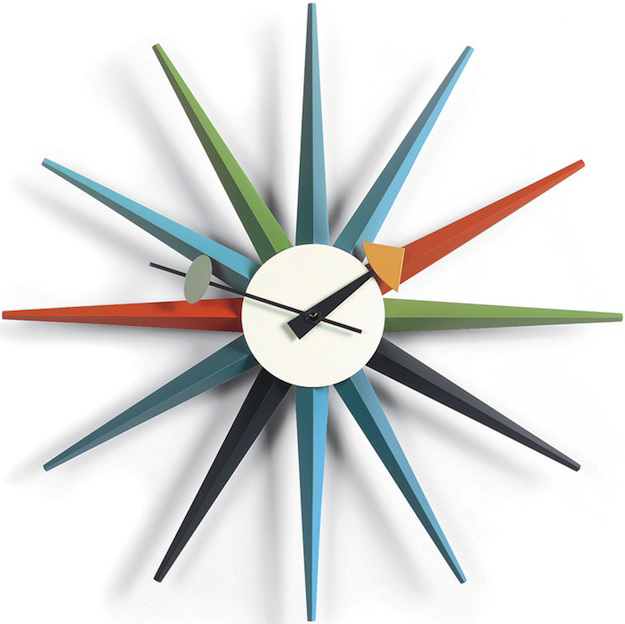 For Howard Miller Clocks, Harper came up with dozens of geometric, numberless wall clocks, resembling exploding stars and suns, spindles, and streamlined abstractions, as well as desk clocks shaped like bubbles, moons, and wooden diamonds mounted on pedestals. 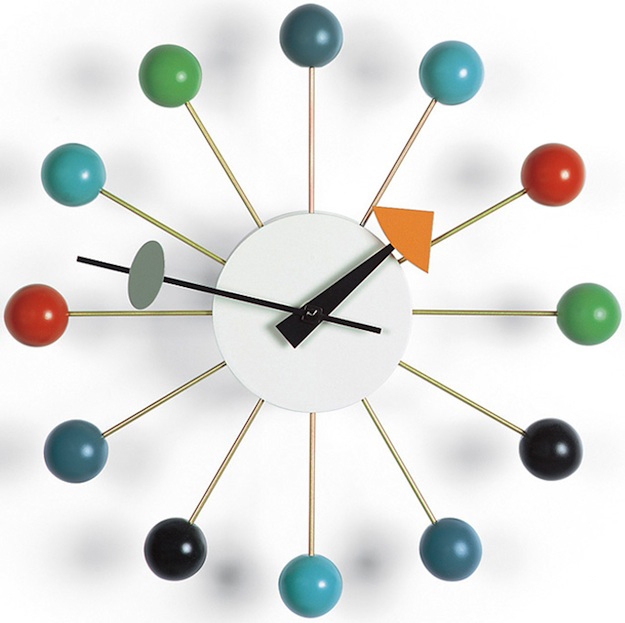 The first of these was the Ball Clock, a wall clock featuring 12 metal spokes capped with colored wooden balls that look like those in an Atomic Model Kit. Ever the showman, Nelson had a knack for creating myths about his firm’s designs. And one myth is so persistent that Harper can do nothing to rebuke it. In fact, the story still lives on the Herman Miller site, where you can hear a recording of Nelson recounting his tale, and on the Design Within Reach web site, which sells a “1948 Nelson Ball Clock” reproduced by the Swiss furniture company Vitra. A persistent myth is that the 1948 Ball Clock emerged out of a drunken dinner party with Harper, George Nelson, Isamu Noguchi, and R. Buckminster Fuller. Harper says in reality he made it at work, like the others. Image via Vitra.com. Over the years, Harper made all sorts of Modernist furniture, graphics, interiors, and housewares for Herman Miller under Nelson’s name, from china sets, plastic silverware cases, and lamps to slide projectors, record players, and typewriters. But besides the Herman Miller logo and the Howard Miller wall clocks, the other Harper design that’s endured is the Marshmallow Sofa—which, initially, was a complete failure. 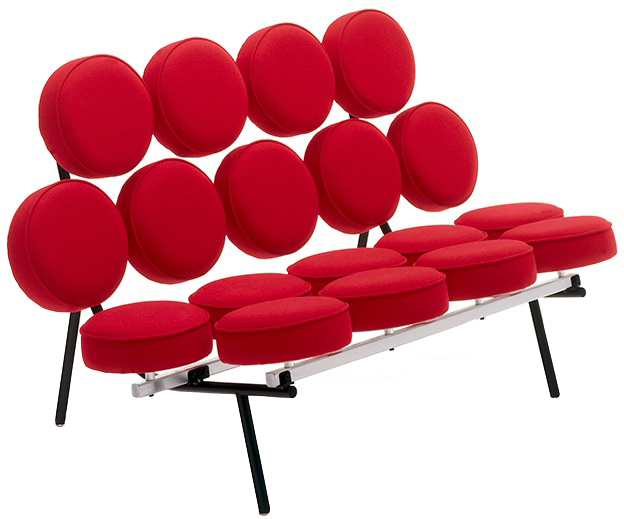 A new edition of the Marshmallow Sofa is currently for sale at the Herman Miller web site. Initially, it was too expensive to be produced in large numbers. Image via HermanMiller.com. Harper built the model over a weekend on a lark in the mid-1950s, after a plastics-company salesman presented Nelson with round, flat vinyl cushions, made of a plastic that supposedly formed its own skin and wouldn’t need to be upholstered. However, the technology required that the cushions could be no larger than 12 inches. Harper took 18 of these vinyl pads, and arranged them into the Marshmallow Sofa design. Ultimately, the self-skinning injection-molded plastic technology—which was meant to save the company the tremendous cost of hand-upholstery—failed, and the Marshmallow Sofa was produced with traditional upholstery. Because it had 18 small cushions, it was even more expensive to make than a regular couch, and initially, Herman Miller only produced 200. However, this strange piece of furniture so captured the spirit of Mid-Century Modern, it developed a cult following. It’s been revived and is offered by Herman Miller today. A new Marshmallow Sofa sells for nearly $5,000, while a vintage one can go for as much as $15,000. Thanks to new Herman Miller editorial director Sam Grawe, former Dwell editor-in-chief, the company’s Why Design series produced a video last fall on Harper’s sculpture called “Paper Is a Versatile Medium” in which Harper is credited with both the Marshmallow Sofa and the Ball Clock. The Herman Miller product page now credits both Nelson and Harper for the couch, while the shopping page does not. 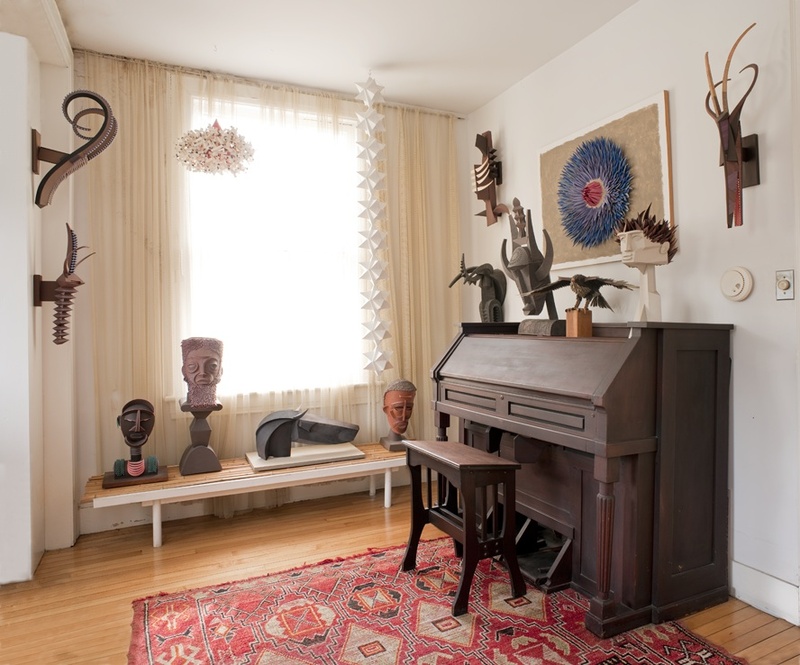 After their daughter, Elizabeth, was born in 1953, Irving Harper and his wife, Belle, moved from New York City to their spacious, sunlight-filled farmhouse in Rye, New York, but they didn’t have much décor of their own, so it was largely empty for 10 years until Harper began his fidgety hobby of tinkering with scrap paper and glue. By 1964, the stakes were high. And Harper, as Nelson’s chief designer, had a bad case of the nerves. He and his team were planning the Chrysler Pavilion for the upcoming New York World’s Fair, which involved building an enormous pool containing islands linked by footbridges. Each island highlighted an aspect of car production, including an enormous walk-in engine with pistons that shot sparks as they jogged up and down. But deadlines and high expectations had him on edge. So he did what any twitchy engineer would do: He built something. One night, he took apart a bamboo window shade and glued the twig-like pieces with household cement into a peculiar mask. 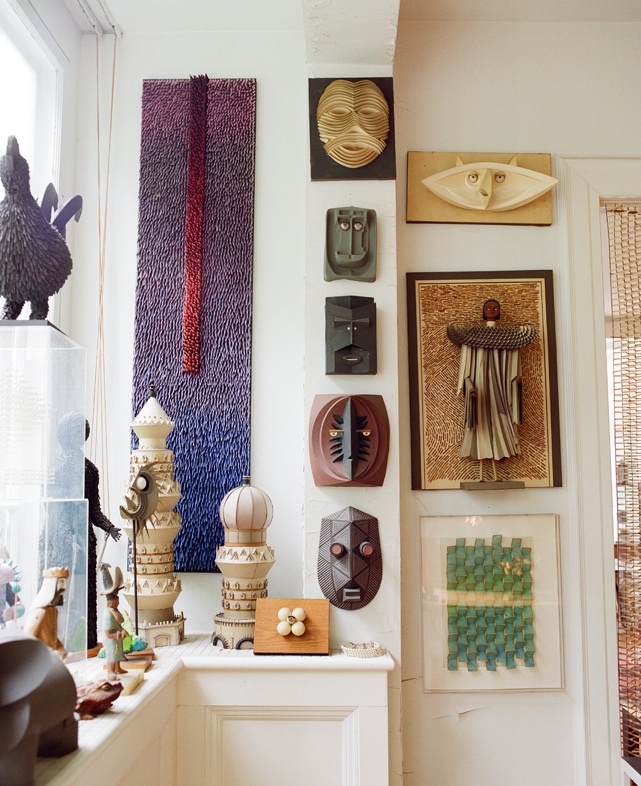 He made more sculptures later that year, when he struck out on his own, joining up with veteran Nelson designer Philip George to create their own firm, Harper+George. The pair developed interiors for companies such as Braniff International Airways and Hallmark Cards, until Harper retired in 1983. The whole time Harper continued to tinker with his playful sculptures, made from paper, Elmer’s glue, and whatever he had lying around the house, like toothpicks, matchsticks, pine cones, pasta, and clock parts. 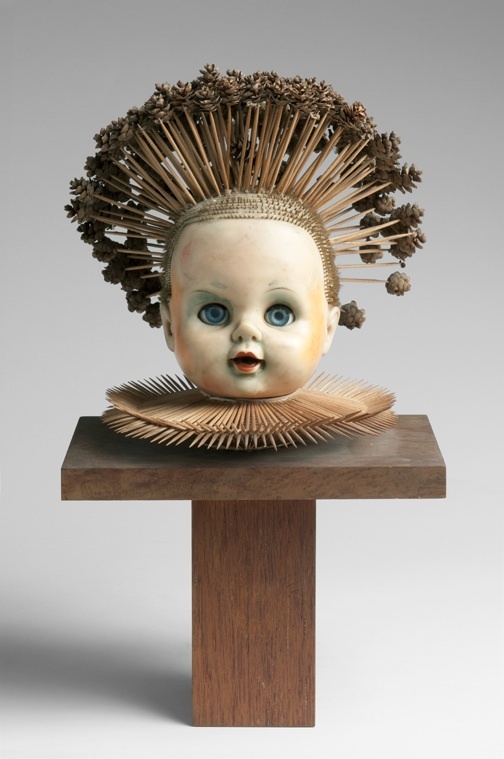 When his daughter got old enough to abandon her dolls, those became material for the Surrealist stage of his art. In 2005, Harper ran out of room to display and store his artworks, which by then numbered around 300, so he stopped making them. Then, in 2009, Belle passed away after 69 years of marriage. When you flip through Irving Harper Works in Paper, it becomes more clear where Harper and other Modernist designers derived their inspiration. It’s obvious Harper loved the popular artists of his time, such a Miró, Kandinsky, and especially Picasso. 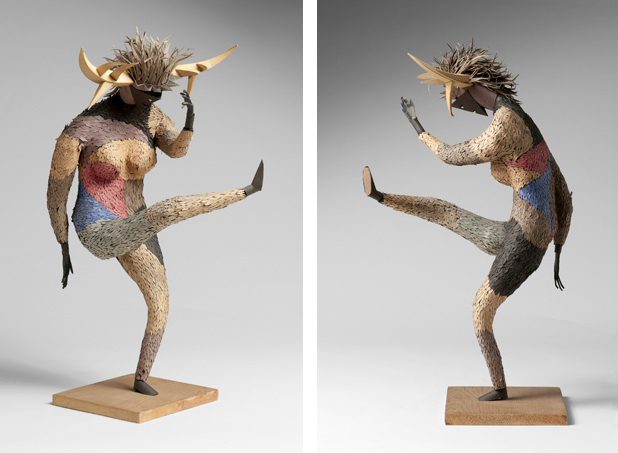 He also reached back to Picasso’s original influences, such as African art. “I got the sense from talking to Irving that he was really interested in working these construction problems: How can I twist this, form that, and build that, working with paper?” Lasky says. “He created an engineering or an architectural-structural problem to solve within the aesthetics of different forms. In fact, Harper is so in love with his own artworks and having them around to admire, that he’s never considered selling them. In his T. interview with Guy Trebay, Harper asserted that he believes he’s come up with an entirely new way to use paper in artwork. 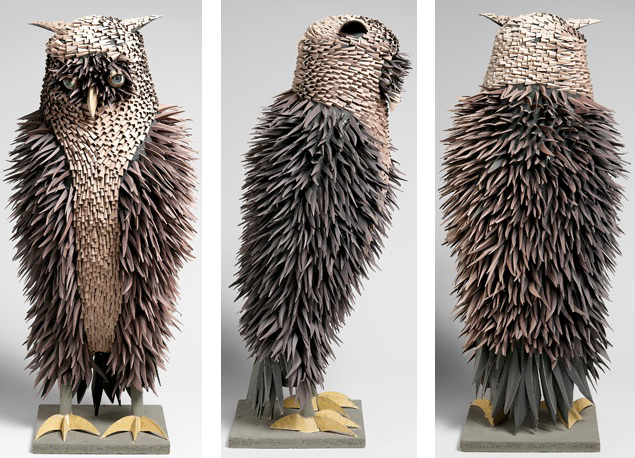 The question is: Do these sculptures show that Irving Harper was shamefully overlooked throughout the 20th century, despite having a great artistic mind and being innovator along the lines of the Eames or Noguchi? Maharam—who’s been talking to Harper about exhibiting the sculpture after his death or auctioning them off to establish a Cooper Union scholarship—believes that Harper’s work was downright revolutionary in a time when all these Mid-Century Modern ideas were new. For more images, “Irving Harper Works in Paper” can be pre-ordered at the Skira Rizzoli web site. Watch Herman Miller’s Why Design video on Irving Harper, “Paper Is a Versatile Medium,” below. Great article and wonderful art. I pre-ordered Harper’s book. Wow fantastic article – thank you! I’ll be looking for the book and re-reading this article – so packed full of information. extraordinary work at once marvelous and beautiful! Great Article and excellent information, Really Art has it’s own language. “ ” It's a powerful medium. Something about it just grabs people by the short hairs.